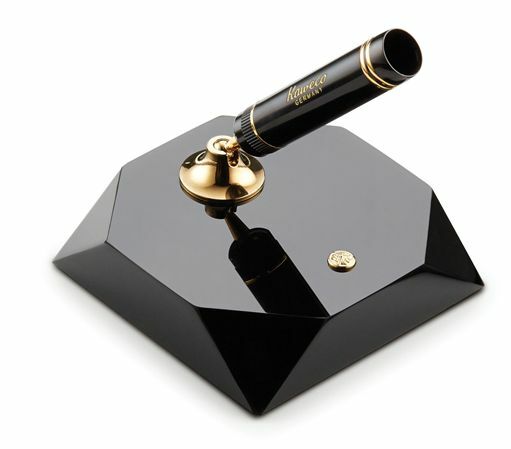 Order your Kaweco Dia 2 Black with Gold Trim Pen Stand today from FahrneysPens.com. Fine Pens, Refills & Luxurious Gifts – great prices & fast shipping. The Dia2 is a beloved Kaweco design first launched in the 1930s. Its unique design element is the distinctive knurling on the cap and barrel in polished black resin. The Dia2 desk stand has a solid base of shiny black acrylic, a rotating nozzle and ball-joint, and holds the Dia2 writing instrument of your choice. Engraving plate also available. Please call for details.